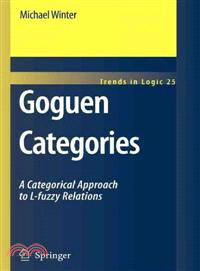 Goguen categories extend the relational calculus and its categorical formalization to the fuzzy world. Starting from the fundamental concepts of sets, binary relations and lattices, this book introduces several categorical formulations of an abstract theory of relations such as allegories, Dedekind categories and related structures. It is shown that neither theory is sufficiently rich to describe basic operations on fuzzy relations.